Your modified adjusted gross income (MAGI) doesn’t appear as a line on your tax return because, in a given year, you could have multiple different modified adjusted gross incomes. 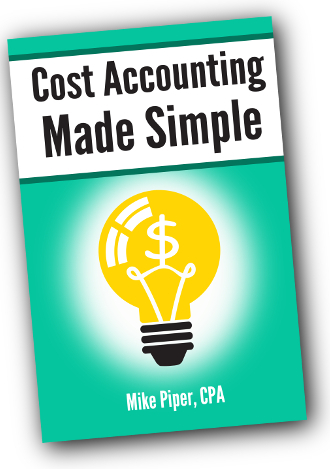 The reason is that your MAGI for the purpose of calculating one deduction or credit is often different from your MAGI when calculating a different deduction or credit. In each case, you start with adjusted gross income (which you can find at the bottom of the first page of your Form 1040), then you modify it in certain ways. But the specific modifications to be made depend on which tax break we’re talking about. In short, it’s never a good idea to assume that you know what is included in modified adjusted gross income in one particular context simply because you’ve seen how the calculation was performed in another context. Is an In-Service 401k Distribution a Good Idea? For readers who aren’t familiar with the concept of an “in-service distribution,” the basic idea is that 401(k) plans can (but are not required to) allow participants to roll their pre-tax contributions, Roth contributions, and employer match contributions over to an IRA after reaching reaching age 59.5, even while the participant is still an employee of the company. When deciding whether or not to take an in-service distribution, the primary factors are very similar to those for considering whether or not to roll over a 401(k) from a previous employer. If the investment costs in your 401(k) are higher than what you’d pay in an IRA (and they usually are), that’s a point in favor of moving the money. If you have made nondeductible contributions to a traditional IRA, and you are planning to convert the traditional IRA (or part of it) to a Roth, you may want to hold off on any in-service distributions until the year after the conversion so as to minimize the portion of the conversion that’s taxable as income. If there’s lawsuit pending against you (or you have reason to expect one in the future), you may want to keep the money in your employer’s plan to take advantage of the protection that such plans have against court judgements. In addition to the above factors, you’ll also want to consider one factor in favor of keeping the money in your current 401(k): There are no minimum distribution requirements from a 401(k) plan while you’re still employed by the company, unless you’re an owner of the company with at least a 5% ownership interest. The reason the lack of RMDs for employees doesn’t matter when considering regular (that is, not in-service) 401(k) rollovers is that if you’re considering a rollover, you must have already left the company, so there would be RMDs beginning at age 70.5, just as there would be with a traditional IRA. As you might imagine, most people do not plan to continue working past age 70.5. And most people do not have any pending lawsuits. Nor are most people considering a Roth conversion of a nondeductible traditional IRA contribution. As a result, for people with the option to do so, it often makes sense to take an in-service distribution as a way to gain access to less expensive investment options. Is a Bond Fund the Same as a Bond Ladder? Whether or not a bond fund and a bond ladder would serve the same purpose in a portfolio depends on what type of bond ladder we’re talking about. Specifically, is it a bond ladder that would be renewed on an ongoing basis as bonds mature, or is it a ladder that would be allowed to wind down over time by spending the money as it comes in? Many bond funds are analogous to bond ladders that are perpetually rebuilt as bonds in the ladder mature. For example, Vanguard’s Intermediate-Term Treasury Fund is roughly similar to a 10-year Treasury bond ladder in which you buy a new 10-year bond each time a bond matures. And Vanguard’s Total Bond Market Index Fund is analogous, but with other types of bonds (e.g., corporate bonds and mortgage-backed bonds) in the ladder as well. It’s important to understand, however, that not all bond funds fit this description. The managers of some actively managed bond funds see it as their job to try to earn excess returns by predicting which way interest rates will move next. As a result, rather than working to maintain a relatively stable average duration for the fund, they will actively shift the fund’s portfolio back and forth between shorter- and longer-term bonds in an attempt to capitalize on their predictions. While a bond fund and a perpetual bond ladder can perform similar roles in a portfolio, a bond fund would typically be a poor replacement for a bond ladder that you plan to wind down over time. For example, a retiree might choose to build a ladder out of Treasury Inflation-Protected Securities (TIPS), with the intention of spending each interest payment as it arrives and spending the principal from each bond when it matures. Doing so would allow for a very predictable stream of inflation-adjusted income over an extended period of time. By way of comparison, the results of holding a TIPS mutual fund and systematically selling a certain number of shares every year would not be so predictable. That’s because, when you liquidate shares of a bond fund, you’re effectively selling a hodgepodge of different bonds, all prior to their maturity dates. And when you sell a bond prior to maturity, you’re exposed to the risk caused by changes in bond prices that occur when market interest rates change. “I retired in 2010 and my wife retired earlier this year. Because of my pension and my wife’s Social Security, our expenses are taken care of, for now. (We’re still in good health, knock on wood!) That could change down the road as medical expenses increase. Your compensation for the year. For these purposes, compensation includes wages and salaries (including commissions), self-employment income, and alimony. Compensation does not include interest, dividends, pension income, annuity income, rental income, deferred compensation, or amounts you can exclude from income (with the exception of nontaxable combat pay). In other words, most retirees will likely need some sort of part-time work in order to be able to contribute to an IRA. Assuming that you meet the income requirement, there’s still one catch for traditional IRA contributions: You cannot make them in the year in which you reach age 70½ or in later years. Roth IRA contributions, however, do not have a maximum age limit. Would Traditional IRA Contributions Be Deductible? 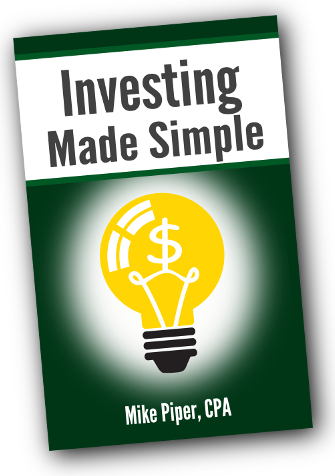 The rules for traditional IRA contributions are the same after retirement as before retirement. That is, the contributions will be deductible if neither you nor your spouse is covered by an employer retirement plan. If either of you is covered by such a plan (as a result of the part time job that you’ve taken on to satisfy the “compensation income” requirement, for instance), then the deductibility of traditional IRA contributions will depend on your modified adjusted gross income being below certain limits. Note: Receiving benefits from a plan with a former employer does not count as being covered by that plan. Which Type of IRA is Better in Retirement? Roth IRAs are not subject to required minimum distribution rules, whereas traditional IRAs are. Important note: If you think it’s likely that this money will eventually be left to your children, the question becomes how your current tax bracket compares to the tax bracket your heirs will be in when they take the money out. And it’s important to know that, because of the rules for inherited IRAs, they’ll have to start taking the money out right away, during their working years. If you would not qualify for deductible traditional IRA contributions, that’s probably because you have a 401(k) or other similar retirement plan at your part-time job. As always, getting any available employer match should be priority #1 in such cases. After getting the maximum match, the Roth-vs-401(k) question is similar to the Roth-vs-traditional analysis above. Like most articles on the IRS website, IRS publications can be excellent for the purpose of gaining a general understanding of a given topic. They’re written in relatively plain English and, as you would expect, the information contained in them is usually an accurate representation of the applicable law(s). However, because IRS publications do not carry any legal authority, if they say something that’s contrary to the actual law, it’s the actual law that matters, not what’s in the IRS publication or article. Said yet another way, IRS publications can be wrong. So if you ever want to be really, really sure about something when it comes to taxes, you’ll want to look for a more authoritative source. The Internal Revenue Code is the actual body of law that contains the rules that make up the federal income tax, payroll taxes, estate and gift taxes, and so on. The language it uses is not exactly intended for a general audience, but when you want an authoritative source on a federal tax topic, the IRC is the first place to look. My favorite place to reference the Internal Revenue Code is Cornell University Law School’s website. Treasury regulations are the Treasury Department’s interpretation of the Internal Revenue Code. They are necessary because the IRC often provides a rather bare-bones framework that leaves many questions unanswered with regard to how the law should actually be applied. There are multiple types of Treasury regulations, and the distinctions are important. Final regulations are binding on the IRS — meaning you can rely on them. Temporary regulations are also binding until superseded by another regulation. Proposed regulations are not binding, but they can still be useful for getting an idea of the IRS’s viewpoint on a given topic. Treasury regulations are available via the GPO website. Revenue rulings are an official form of guidance issued by the IRS explaining how the law would be applied to a specific set of facts. You can find revenue rulings from the last several years on the IRS website. Private letter rulings are akin to revenue rulings in that they show how the IRS would apply the law to a specific set of facts. But there’s one big difference: Private letter rulings are only binding on the IRS with respect to the taxpayer who requested the ruling, so other taxpayers cannot rely on them as legal precedent. That said, like proposed regulations, private letter rulings can still be useful for getting an idea of the IRS’s view on a particular matter. Past private letter rulings are also available on the IRS website. Finally, federal courts’ rulings about tax matters (e.g, opinions issued by the U.S. Tax Court) are a source of legal precedent. 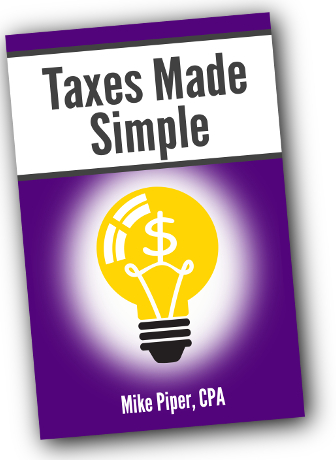 Personally, however, I’ve found that the majority of everyday tax questions can be answered without having to look outside of the Internal Revenue Code and the types of IRS-issued guidance discussed above. The yield curve is one of the most fundamental concepts of fixed-income investing. In short, it’s a graphical depiction of the yields for bonds (or other fixed-income investments, such as CDs) of varying maturities. You’ll notice that the yield curve is sloped upward. That’s typical. In normal (though not all) circumstances, longer-term bonds have higher yields than shorter-term bonds. Greater interest rate risk (because, as we’ve discussed before, the longer a bond’s duration, the more its price changes as a result of changes in market interest rates). As you can see, the yield curve for AA-rated corporate bonds is also upward-sloping (again, because longer-term bonds have higher risk than shorter-term bonds). 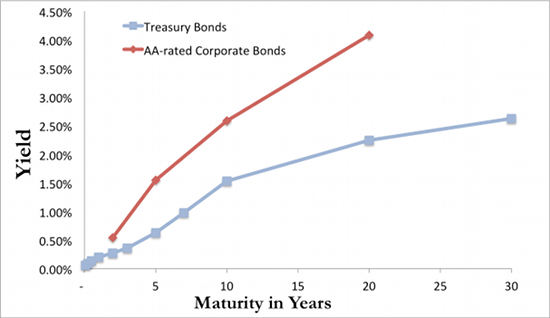 You’ll also notice that the yield for AA-rated corporate bonds of each maturity is greater than the yield for Treasury bonds of that maturity. That’s because corporate bonds have greater credit risk, so investors demand a higher yield. And as you would expect, corporate bonds of other credit ratings have their own yield curves, as do TIPS and tax-exempt muni bonds. Personally, I find the yield curve for TIPS (and Larry Swedroe’s related monthly articles) to be of particular interest. Unlike with other bonds, going farther out on the yield curve with TIPS (that is, buying longer-term TIPS) doesn’t mean taking on a great deal of inflation risk. 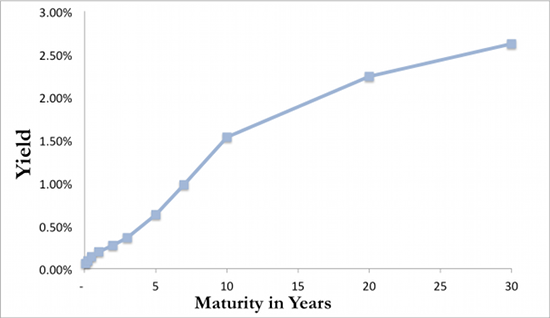 And if you expect to hold the TIPS until maturity, the interest rate risk isn’t a particularly large problem either. As a result, when yields on long-term TIPS are high, it can make sense for certain investors to shift their allocations toward them. For example, if, based on the TIPS yield curve at a given time, an investor can meet all of her retirement goals with very little risk by moving most of her portfolio to long-term TIPS, I think it can be entirely reasonable to do so.